Guest speaker Earlean Collins presented regarding her role with the Cook County Board for District One. Mrs. Collins stated that she served on the Illinois Senate for 21 years before retiring and serving on the Cook County Board. She mentioned that she was raised a Democrat and continues to believe not only in the sharing of responsibilities but also in the sharing of benefits. Mrs. Collins went on to say that the top two responsibilities of the Board are public health and public safety. She expressed that the main challenge of the Board is finding enough revenue to fund the services that need to be provided. She explained that currently there is an increase in the need for services but a decrease in the amount of revenue generated. Therefore, the Board must find ways of retrieving revenue and they are currently doing so through property taxes, fees generated from the court system and sales taxes. However, she went on to explain, that the revenue generated not only goes to the Board to disperse to services being provided but they also are divided with the City of Chicago, the park district and the Chicago Transit Authority. In fact, she stated that only about 1.7% of the revenue generated goes to the Board. One idea for generating more revenue Mrs. Collins presented, was to become a municipality. She stated that by being a municipality you are able to generate revenue in other ways. One other challenge the Board is faced with according to Mrs. Collins is within the time limits in which the revenue can be spend once obtained. She stated that the revenue has to be spent within a specified time frame and that if that revenue is not spend within that time frame the revenue is lost and possibly given to another organization competing for it the following year. Mrs. Collins also spoke briefly about the John Stroger Jr. Hospital of Cook County. She mentioned that the services provided by the county hospital are not funded by the state of Illinois but from the county of Cook alone due to an agreement set-up prior to her involvement with the Board. Therefore, money can not be obtained from the state to help with generating revenue for services need at the hospital. She stated that one idea she had for combating this was to sue the state for not contributing to the revenue needed for services being provided by the hospital. However, she stated that this idea was not well accepted by others and has not been implemented. One other issue in regards to the hospital that was briefly discussed was the issue of billing patients for services provided by the hospital. Mrs. Collins confirmed that in the past the hospital was not billing patients for services due to the idea that is was a “free” hospital. However, they are now implementing a billing process and she feels this is a step in the right direction to help alleviate the revenue building for the hospital services from solely the taxpayers. Mrs. Collins also presented a little bit about the juvenile detention center and court system. She mentioned that she is currently working towards ways of decreasing the enormous amount of revenue going towards housing juveniles who have been convicted on non-violent crimes. Discussion of the August barbecue was postponed by John Scheer until the next board meeting. In regards to Planning, Preservation and Development, Scott Rappe stated that his letter regarding “The Winchester” contingencies presented at the previous Board Meeting mentioned that one of the contingencies was no more that 44 chairs in the outdoor cafe. However, the secretary report stated no more that 50. 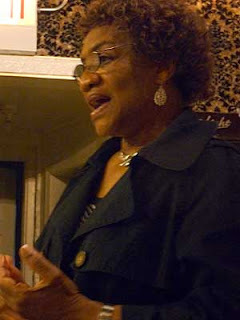 Dana Palmer reviewed her secretary reports which confirmed that vote at the May 4, 2009 membership meeting stated 50 versus 44. Therefore, Mr. Rappe will amend his letter to be resubmitted. Stephen Rynkiewicz stated that EVA is now on Twitter under evachicago. Steven Crane mentioned that he received two new memberships for EVA. He and Brodi Cole agreed to look into membership renewal comparing the membership list with the Paypal report to find out who still needs to renew. Rich Anselmo stated that he will continue to attempt to reach Joe Hunewinkel regarding making a postcard to distribute to East Village residents directing them to the EVA website. Rich Anselmo and Scott Rappe stated that they would go together to present to the Alderman's office about Pedestrian designations for the properties at the Pizza Hut, Post Office and Walgreens.